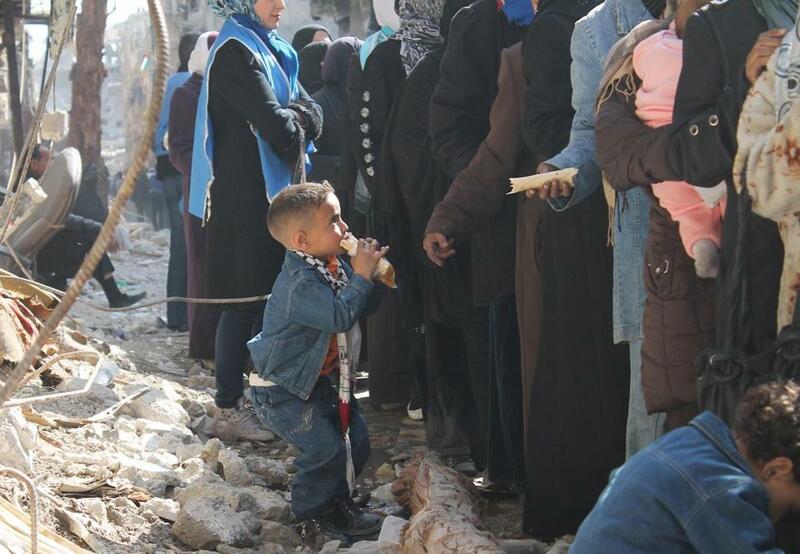 Children and women waited for UN food parcels at a Syrian refugee camp last week. DAMASCUS — Food deliveries to thousands of people living in a blockaded area in southern Damascus were halted after a truce collapsed and clashes broke out between Syrian rebels and forces loyal to the government, a UN official and activists said on Monday. The clashes, which erupted on Sunday afternoon and lasted until Monday morning, were the most serious violence in weeks in the Syrian capital’s Palestinian-dominated district of Yarmouk and seriously undermined a tentative truce struck there in early January. A UN spokesman in Damascus, Chris Gunness, urged all parties to ‘‘immediately allow’’ the resumption of aid to the area, where malnutrition is rife. The United Nations ‘‘remains deeply concerned about the desperate humanitarian situation in Yarmouk, and the fact that increasing tensions and resort to armed force have disrupted its efforts to alleviate the desperate plight of civilians,’’ Gunness said Monday. Activists estimate that over 100 people have died of hunger or hunger-related illnesses since a blockade began nearly a year ago, preventing food and medical aid from entering Yarmouk. The halt in the food distribution in Yarmouk also underscores problems that bedevil a Feb. 22 UN Security Council resolution that called on warring parties to facilitate food and aid deliveries to Syrians in need. Also Monday, presidential adviser Bouthaina Shaaban said presidential elections would be held on time according to the constitution, most probably in the spring. Shaaban said Syria would not accept international experts to monitor the vote. ‘‘We are a sovereign country and we have credibility; we don’t need monitors,’’ she told the Lebanon-based Al-Mayadeen station. Shaaban had suggested earlier that the vote might not be held because of the security situation, but on Monday, she said the situation on the ground was ‘‘improving’’ in light of the Syrian army’s successes on the battlefield. Assad’s term expires in mid-July and he has suggested he will run again. The vote must be between 60 and 90 days before that. The latest clashes in Yarmouk sparked concerns for future aid deliveries. ‘‘It will be like it was before. We are back to zero,’’ said a Yarmouk-based activist who uses the name Abu Akram. The truce, which took months to negotiate, collapsed after rebel gunmen returned to Yarmouk on Sunday, according to activists. The rebels had withdrawn from the area about a month ago as part of the truce, replaced by a patrol of Palestinian gunmen, keeping out both rebels and fighters loyal to President Bashar Assad. The rebels accused pro-Assad fighters of violating the truce, said Abu Akram. An activist group, ‘‘Palestinians of Syria,’’ voiced similar accusations. On Saturday, the rebels said Assad loyalists were sneaking weapons into Yarmouk under the guise of the joint patrols, delaying food distribution, and arresting young men waiting for UN food parcels. ‘‘Reconciliation efforts have, in my opinion, reached a deadlock,’’ said Anwar Raja, the spokesman for the pro-Assad Popular Front for the Liberation of Palestine — General Command. Forces loyal to Assad initially began blockading the camp to force out rebel gunmen. Since the uprising began three years ago against Assad’s rule, blockades have played a key role in government efforts to crush rebels in their enclaves and strongholds. The United Nations began distributing food to Yarmouk on Jan. 18 after warring parties agreed to a truce. The distribution was hindered by sporadic clashes, including on Feb. 7 and 8, said Gunness. In total, the United Nations has distributed 7,708 food parcels to Yarmouk’s 18,000 registered Palestinian refugees. Activists say there are thousands more displaced Syrians also living in the district and suffering from malnutrition. More than 140,000 people have been killed since March 2011, when the uprising against Assad erupted. Volunteers from across the Sunni Muslim world have joined Syrian rebel groups, in particular an Al Qaeda breakaway faction. Lebanese and Iraqi Shi’ites, meanwhile, are fighting on the government side. Saudi Arabia’s Cabinet on Monday called for the withdrawal of all foreign fighters from Syria, demanding they face international justice if they committed war crimes there. Riyadh is concerned that Saudi militants in Syria could turn their weapons on the kingdom, and last month Saudi Arabia’s King Abdullah decreed it a crime for Saudi nationals to fight in foreign conflicts. The move was largely aimed at curbing extremist Saudis fighting alongside Syrian rebels.